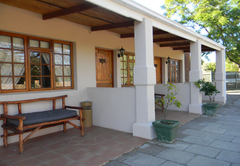 Aan die Oewer Guesthouse is a 3 star graded guest house with self catering option, offering Graaff Reinet accommodation for tourists and visitors of Karoo Heartland. 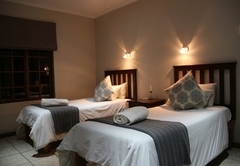 Come and enjoy the comfort, peace and tranquillity of Aan-die-Oewer’s exquisite 3-star facilities and top-class service. 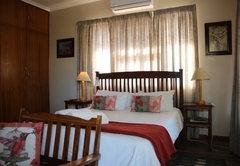 Situated on the banks of the Sundays River in a quiet part of this historical town, Aan-die-Oewer offers both B&B (full English breakfast available) and self-catering options with all the essentials. 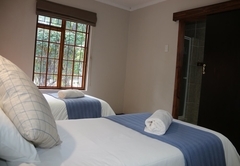 The two family units and five single units all have private entrances, en-suite bathrooms, DStv sports and movie channels, air-conditioning, braai facilities and secure parking. This room has three single beds. There is air conditioning, a small bar fridge and an en-suite bathroom with a shower. 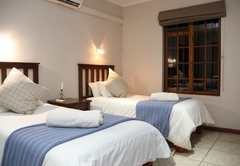 The room has two single beds and a bathroom with shower only. There is air-conditioning and towels are supplied. There are braai facilities outside. 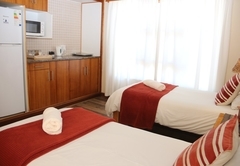 The unit consists of two bedrooms (one furnished with a double bed and the other with three single beds), a fridge and a large en-suite bathroom with both shower and bath. 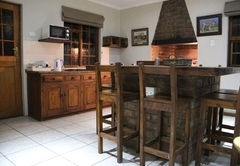 The cottage consists two bedrooms (each with two single beds, en-suite bathrooms and aircon), fully equipped kitchen, indoor braai area and sitting area with another two single beds. Breakfast with homemade preserves are served in the breakfast room just off the guest lounge. 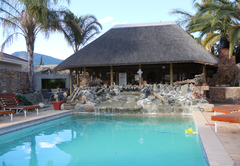 The pool and lapa areas are ideal for a cold, refreshing drink on a hot summer’s day and can also be utilised as a unique conference facility for smaller groups of up to twenty people. 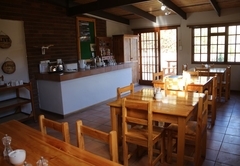 Visitors at Aan-die-Oewer can enjoy breathtaking views of the surrounding mountains and game reserve or enjoy the comforting shade of the old oak tree overlooking a large play area for the kids. 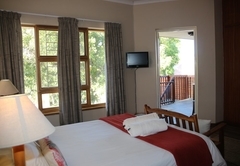 Graaff Reinet and surrounds offer various leisure and sports activities, as well as a number of restaurants. 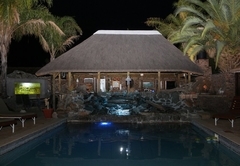 Or at night it might be enough to just experience the peace and quiet of staring at the endless, star-studded Karoo sky. 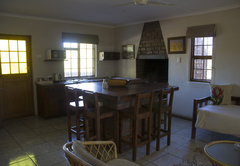 This self catering cottage has a big entertainment area with fully equipped kitchen and indoor braai (BBQ). 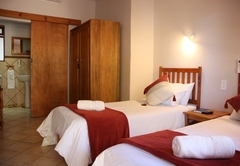 Both rooms have modern, en-suite bathrooms offering showers, basins and toilets. 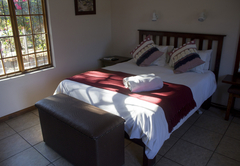 Bedrooms have a total of 6 single beds. 1 Room is air-conditioned. This room has 3 single beds. The bathroom offers a shower, basin and toilet. 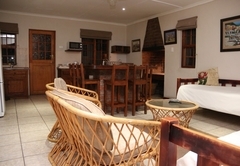 Braai (BBQ) facilities available outside room. Towels are supplied. This room has 2 single beds. The bathroom offers a shower, basin and toilet. 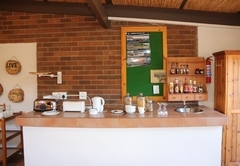 Braai (BBQ) facilities available outside room. Room is air-conditioned. Towels are supplied. 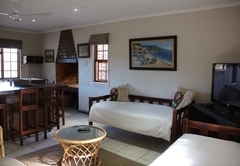 This family unit consist of 2 bedrooms, one with a double bed and one with 3 single beds. The spacious, modern bathroom offers a shower, bath, basin and toilet. Towels are supplied. 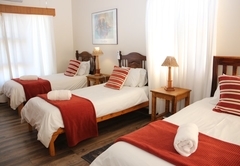 A decent little spot with very friendly staff, our visit to Graaf Reinet was during the hot month of December so the fact the rooms had aircon was a welcomed extra. The rest is rather basic but not bad at all for what was paid for the room. 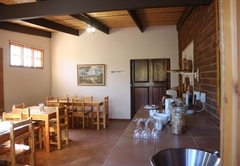 Response timeAan die Oewer Guesthouse typically responds to requests in 5-10 minutes.